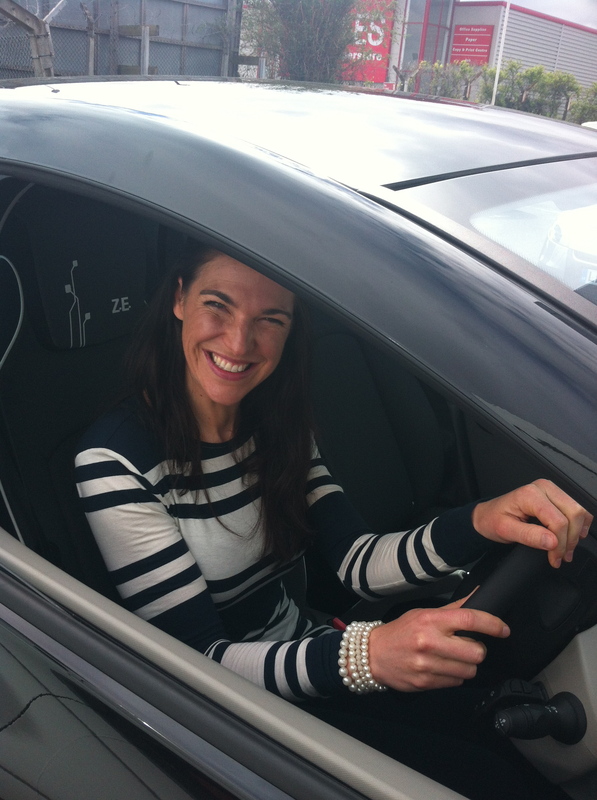 I was lucky enough to get a preview test drive in the electric Renault Zoe over the bank holiday, and I am smitten! It hits the streets next month in the UK and I think that lots of other people and companies will fall for its charm too. I think it is a very special car, and a long awaited turning point for the electric car market. It’s the perfect size for a family with a dog and a small person or two, and all of their clobber and maybe some surfing gear too. It’s a really good-looking car (the only better looking electric car is the Tesla but you pay about £60,000 more for that) with a really nice sporty interior. Its really good value at £13,995 (this is with the Governments Plug in car Grant of £5,000) and about £70 pm to lease the battery. Leasing the battery (alongside the Nissan Leaf, this is a first for the electric car market in the UK) means that Renault will guarantee that your battery remains at 75% efficiency or above during the first 4 years, and will repair it if it falls below, or replace it if it is unrepairable, and they also told me they would replace it with the latest battery, rather than just a like for like replacement. It only has one charge point, instead of two or three for all the different types of chargers around. British Gas will fit your home charge point at no direct cost to you – 75% of this cost is covered by the Government, and the other 25% by Renault. Its really nippy for those impatient drivers amongst you, and it is of course almost totally silent bar a few internal beeps to alert the driver to certain things. It has no tailpipe emissions so you won’t gas yours and other people’s children when you pick them up from school, or pedestrians as you sit in traffic or drive through central areas. However, it does have other impacts, see below for more on this. It’s range is 94 miles on a good day the really nice Renault man told me, even though the spec says some 130 miles. And this will be less if it’s a cold day (maybe only 62 miles) due to the lithium battery. This only matters if you are planning long distances with your car of course, as for those who just plan to use it for the school run, and nipping around town will be just fine. For those who want to do longer trips, there does seem to be a growing number of charge points across the country, which are not restricted to large city centres. According to Next Green Car site there are some 4,833 charge points across the UK now, however, the maths doesn’t add up if you look at how many charge points the different providers are claiming they have individually – it adds up to more happily, but the question is whether the providers are consolidating their information to make it easy for EV users to find out where all their charge points are, rather than just providing information about their own points. Charity Zero Carbon World are trying to consolidate all this information, so watch this space but I think they have a way to go. The suppliers all have different membership/registration requirements too, which could also be a pain. From what I could find, the main provider of charge points in the UK is Chargemaster, who has some 4000 Polar charging systems in the UK, at supermarkets, shopping centres, city centres and leisure centres. The Government has pledged £37m to subsidise these new charge points under their Plugged in Places scheme. The other key providers, who also receive some of this subsidy are Source London, who has some 790 points in London, Source East who has some 195 points in the East of England, and Pod points who has some 200 charge points. Most excitingly Ecotricity has 14 (wind powered, naturally) charge points with 22 coming soon, all free to use. This is where it becomes very interesting for those who really want to reduce the impact of their driving because by using renewable energy to charge your EV, you can greatly reduce its impact. More on this below. As I mentioned there are no tailpipe emissions with the Zoe, but of course there are impacts associated with the production, disposal and electricity generation to fuel these cars. 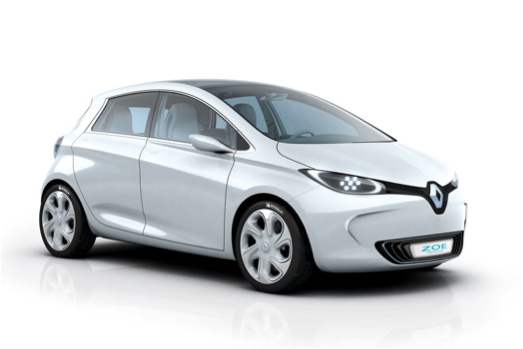 The nice man at Renault told me the well to wheel impact of the Zoe is 54g CO2/km – which means the impact of the electricity production and getting it to the car, as well as the impact of the actual production and disposal/recycling of the car. This compares to an average of 120-150kg/Co/Km for an average petrol or diesel car in the UK. Obviously this is better but it is a long way from being carbon neutral or no impact. This figure will fall as production facilities become more efficient and although Renault do not have a sustainability report, or targets that I can find, they are going in the right direction, with activities such as using more recycled materials in their production, and aiming to reduce their co2 emissions in their production facilities, including a zero emission facility in Morocco. However, the impact of production and disposal of lithium batteries also has to be taken into consideration, as they use a lot of metal which is mined, in some cases from ecologically fragile and beautiful areas. To counter this, Renault has set up a partnership with a recycled company to recycle these batteries and all elements of them going forward, but I would be interested to see the results of this, and to understand the impact of a burgeoning EV market reliant on lithium batteries. The other key way to reduce this impact figure is to charge the car using renewable energy. Most of us get our energy from the grid, and so get what we are given, but by signing up to a renewables provider, more renewable energy will be fed into the grid, making electricity use less impactful overall. (I am a Good Energy customer because they only source energy from renewable sources from independent suppliers across the UK, and they support micro generation, and they also provide great customer service.) This is why we need more renewably powered charge points, so I am hoping I can persuade my local hospital to put one of these solar charged units in place – they can keep the excess electricity and maybe also get paid by the charge point provider. Charity Zero Carbon World are also aiming to put in place lots of renewably powered charged points so again deserve a mention, but they don’t say how many they have put in so far yet. The EV market is finally a real contender – Tesla has posted its long awaited first profit, and finally the manufacturers are leasing the batteries to help maintain the range and value of EVs. Charge points are breeding almost like rabbits, and it is also great to see the Nissan Leaf now being made in Sunderland. I am also really excited about the impact the growing EV market will have on house prices, air quality and quality of life for those people who live by major road networks. My key wish however is for more solar charge points, so I will be keeping an eye out for these, and also a simple one stop shop for all charge points across the UK. With thanks to Manjit Sahota at Renault London West for tolerating my driving so calmly and answering my multitude of questions with enthusiasm and expertise.